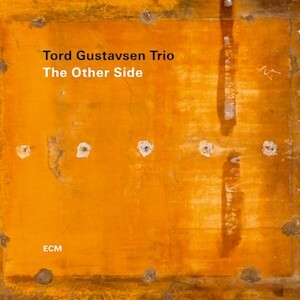 Personnel - Tord Gustavsen: piano; Sigurd Hole: acoustic bass; Jarle Vespestad: drums. Generating deeply moving sounds through a close interplay, the Tord Gustavsen Trio, inactive since 2007, takes us to The Other Side with staggering new originals and admirable renditions of traditional songs and classical pieces, including three by J.S. Bach. The Norwegian pianist and composer plays alongside his longtime drummer Jarle Vespestad and the new bassist Sigurd Hole, two excellent accompanists who provide him with all the rhythmic sustenance and enchanting texture he needs to make this one of the most gratifying releases of his career. The opening title, “The Tunnel”, shows Gustavsen and his partners plunging into tranquil, limpid waters that reflect their ability to create beautiful, intimate moods with a ample musical spaciousness. The graceful pianism stresses the poignant primacy of the melody while the autonomous pulse emphasizes it even more. The piece that follows, “Kirken, Den Er Et Gammelt Hus”, was penned by the 19th-century Norwegian composer Ludvig Mathias Lindeman and comes to life through a radiant bass intro. It maintains a haunting sophistication in sound as the folk intonations increase. The melodies, true poetic declamations, have a remarkably soothing effect, soaring on top of an undeviating pulse that never ceases to underline diligence, unity, and generosity. If “Re-Melt” is a sensitive 3/4 composition with a few occasional Jarrett-esque rhythmic accents, then, I would call “Duality”, a pure, free, and minimalist improvised meditation where scattered tom-tom initiatives, gliding bow work, and profound melodic inspirations carve out abundant room for us to picture immeasurable, resplendent landscapes. The influence of classical music is unconcealed on tunes like the traditional “Ingen Vinner Frem Til Den Evige R”, a parade of deep-toned textures that make up a mournful love song; “Taste and See”, which I can imagine being sung by Sting with the same expressionism of “My One and Only Love”; and the soft-as-a-whisper “Jesu Meine Freude - Jesus, Det En”, where the interpretation of a chorale by Bach splices with a traditional song, falling in between the liturgical and the nocturnal. The downbeat yet fluent “O Traurigkeit” is another Bach’s hymn, which, despite taciturn in tone, is rich in emotion and solid in texture. It’s a good example on how the trio puts delicate fragility and tensile creativity in the same context. Returning to a slow triple meter, they dig the sedate title track with the habitual curvy lines that characterize Gustavsen’s music, but it is on the introspective “Curves” that they get closer to perfection. This is a magnificent illustration of an extramundane world filled with bliss, tenderness, and sensitivity. There are no extravagances but plenty of utterly beautiful moments that take you to another dimension. The record is soulful and inspired, and Gustavsen and his bandmates are all refined musical taste, originality, and perception.